I have been contacted by a number of residents concerned about an application for four 126metre turbines at Tranwell Airfield, which would have a big impact on Stannington, Walton and the surrounding villages in my constituency. I am on the record as being a big supporter of renewable energy. I think it is vital we invest in green technologies to head off what will be an energy crisis, as we cannot continue to rely on fossil fuels forever. When it comes to wind I openly support offshore wind, and the small wind turbines for individual houses or individual farms, as has been used so successfully in many local farms particularly in the National Park. However, there is no question large onshore wind turbines - such as this application and the many others we have seen recently, are dividing communities. We need an overhaul of the planning and subsidy system concerning these onshore Wind Turbines: the focus should be on building community support, perhaps through dividing revenue streams, and the provision of sustainable energy on a community basis. Until that is fixed we are going to be stuck in this planning cul-de-sac, with random construction, which blights local communities and undermines the cause of renewable energy. I have previously written to the Secretary of State on the matter calling for reform, and co-sponsored a 500 metre wind farm planning guidance Bill, similar to the one that exists in Scotland. Planning, of course, is a matter for the County Council, who need to come up with a definitive local plan - but have yet to do so. We need to secure our energy future but imposing these huge turbines on communities who receive little or no benefit is not the answer. There is a meeting tonight to discuss the application at Stannington Village Hall at 7.30pm. I genuinely cannot make it myself tonight but have met other concerned residents on this issue previously. The local County Councillor Eileen Armstrong will be there. I would urge residents to go along, find our more, and communicate their concerns to the County Council. On Friday 8th February the local people of North Northumberland will select the Conservative candidate for the Berwick upon Tweed parliamentary seat. The key point is that it is by way of open primary - which means that any one of the 60,000+ voters can attend the open primary, which will take place at 7pm on February 8, at the Northumberland Hall in Alnwick. There are 3 finalists - all living in the North East: Anne Marie Trevelyan, who stood against Sir Alan Beith in 2010, and reduced his majority significantly, Chris Galley from Otterburn, and Lucille Nicholson from County Durham. I will be attending as a neutral non voting helper, but the fact that it is an open primary allows any local registered voter to attend. 1. Mr Galley lives by the Otterburn Ranges in Northumberland where he runs a sheep farm. He has worked for Shell for 29 years and is currently the company’s scheduling manager. Mr Galley plays rugby for Border Park and is also the club chairman. He is also deputy chairman of Hexham Conservative Association. 2. Mrs Nicholson is a farmer and businesswoman. She is currently chairman of North Durham Conservative Association and former chairman of Conservative Business Relations (North East), a body which organises networking and policy events for businesses. Mrs Nicholson has contested general elections twice, in 1997 for the Referendum Party and 2005 for the Tories. She was educated at London University. 3. Mrs Trevelyan, a chartered accountant, lives and works in Northumberland. She is a governor of Berwick Academy and Northumbria Healthcare NHS Foundation Trust, and campaign director for the Dual The A1 and Broadband4Northumberland campaigns. Mrs Trevelyan fought Sir Alan at the 2010 election and was defeated, but achieved an 8.3% swing in favour of the Tories. The chairman of the Berwick Conservative Association, said: “Local residents have shown great enthusiasm for the open primary by booking their places early in large numbers. The huge appetite we are seeing for our selection meeting is a welcome sign that many people want to engage with politics and with the local Conservative party. Interesting day in the House - will the Liberals support the proposal to change parliamentary boundaries? Update:Boundary reform defeated by 334 to 292 so present parliamentary boundaries will be the same at 2015 as at 2010. The defeat of boundary reform this afternoon, is not a good day for democracy. We would have cut the cost of politics, and made the key point that constituencies should have equal number of votes so that votes have equal value. The arrangement where the Conservatives or other parties have to secure a 7% lead over the Labour Party in votes to have an equal number of seats is unfair. If the Labour Party get more MPs but fewer votes than the Conservatives at the next election which party would the Lib Dems regard as having greater democracy legitimacy? We will bring forward a Referendum Bill on electoral reform, which includes provision for the introduction of the Alternative Vote in the event of a positive result in the referendum, as well as for the creation of fewer and more equal sized constituencies. We will whip both Parliamentary parties in both Houses to support a simple majority referendum on the Alternative Vote, without prejudice to the positions parties will take during such a referendum. If the Conservatives had failed to deliver an AV referendum then the Lib Dems would have had a point. As it is there was nothing in the Coalition Agreement which the Conservatives have broken. There was a pledge to set up a committee on Lords Reform - not to approve whatever it might propose. As it was the Lords reform Bill passed by a massive majority at second reading. The only defeat was on a timetable motion. Less than 100 days to go to local elections so will be out supporting Colin Cessford this afternoon as the sun comes out, and the thaw looks likely to be in motion. Got a bargain haircut for £3! On thursday I returned to the wonderful Northumberland College building in the centre of Hexham. I met once more with the students and their tutor who is guiding them through their hairdressing course. Having promised to return for a cut I duly returned on thursday afternoon & received a cut from the students, who are all loving their course. Had really good chats with the girls from Whitfield, Crawcrook and Prudhoe who are on the course. If this college did not exist they would have to try and get in to Newcastle to study. This is a great example of the government trying to do its bit to bring proper courses to the rural community, not just the big city centres. My experience was with the hairderssers but the college also does everything from accounting to business administration to social care and tourism courses, and so much more. It is doing very well and full praise to everyone involved. It was also a really good value for money haircut at £3! Breakfast canvassing in Haltwhistle with Ian Hutchinson in the snow - lots of people in and a really good response, then Potholes for elevenses with ITV, Surgeries all afternoon in Hexham and Humshaugh, and 5 a side footie for afters for 90 long minutes this evening. Long day, and only just made it home sliding around on the back roads to Stamfordham. For me it is about priorities. Many people are working to get this matter resolved, and alleviate the impact on the key affected local businesses. Clearly there are many road projects in Northumberland. Do not get me started on the failure to repair the potholes. But the access and success of the Northumberland Show must surely be our number one tourist / economic regeneration priority? Mrs Merkel, the German Chancellor, said she wants to see a deal after David Cameron called for radical EU reforms and promised a public vote on Britain's membership. "Germany, and I personally, want Britain to be an important part and an active member of the European Union," she said today. "We are prepared to talk about British wishes .. We will talk intensively with Britain about its individual ideas but that has some time over the months ahead." I would call this a very positive reaction. However, Ed Miliband, at PMQs, said he does "not want an in-out referendum" on Britain's membership. "I’m in favour of us staying within Europe but I think this is a big issue that needs to be put to the British people so they can decide in the end," he said. What is clear is that on this issue there is now a straight choice. I am not going to repeat the PMs speech or waste time repeating Miliband's refusal to countenance a vote. The facts speak for themselves. "What Churchill described as the twin marauders of war and tyranny have been almost entirely banished from our continent. Today, hundreds of millions dwell in freedom, from the Baltic to the Adriatic, from the Western Approaches to the Aegean. And while we must never take this for granted, the first purpose of the European Union - to secure peace - has been achieved and we should pay tribute to all those in the EU, alongside NATO, who made that happen. But today the main, over-riding purpose of the European Union is different: not to win peace, but to secure prosperity." If we don't address these challenges, the danger is that Europe will fail and the British people will drift towards the exit. I do not want that to happen." "People are increasingly frustrated that decisions taken further and further away from them mean their living standards are slashed through enforced austerity or their taxes are used to bail out governments on the other side of the continent. "We are starting to see this in the demonstrations on the streets of Athens, Madrid and Rome. We are seeing it in the parliaments of Berlin, Helsinki and the Hague. "At the core of the European Union must be, as it is now, the single market. Britain is at the heart of that single market, and must remain so. "But when the single market remains incomplete in services, energy and digital - the very sectors that are the engines of a modern economy - it is only half the success it could be. "Can we really justify the huge number of expensive peripheral European institutions? Can we justify a Commission that gets ever larger? "Can we carry on with an organisation that has a multi-billion pound budget but not enough focus on controlling spending and shutting down programmes that haven't worked? "Some say this will unravel the principle of the EU - and that you can't pick and choose on the basis of what your nation needs. "But far from unravelling the EU, this will in fact bind its Members more closely because such flexible, willing cooperation is a much stronger glue than compulsion from the centre." "Power must be able to flow back to Member States, not just away from them... Countries are different. They make different choices. We cannot harmonise everything. For example, it is neither right nor necessary to claim that the integrity of the single market, or full membership of the European Union requires the working hours of British hospital doctors to be set in Brussels irrespective of the views of British parliamentarians and practitioners. "In the same way we need to examine whether the balance is right in so many areas where the European Union has legislated including on the environment, social affairs and crime. "Some people say that to point this out is irresponsible, creates uncertainty for business and puts a question mark over Britain's place in the European Union. "But the question mark is already there and ignoring it won't make it go away. "In fact, quite the reverse. Those who refuse to contemplate consulting the British people, would in my view make more likely our eventual exit. "Simply asking the British people to carry on accepting a European settlement over which they have had little choice is a path to ensuring that when the question is finally put - and at some stage it will have to be - it is much more likely that the British people will reject the EU. "That is why I am in favour of a referendum. I believe in confronting this issue - shaping it, leading the debate. Not simply hoping a difficult situation will go away." "It will be a relationship with the single market at its heart. "And when we have negotiated that new settlement, we will give the British people a referendum with a very simple in or out choice. To stay in the EU on these new terms; or come out altogether. "It will be an in/out referendum." I was out with the team in Hexham's West End last Saturday, supporting our candidate Colin Cessford, with a dozen chilly enthusiastic helpers. We will be out campaigning again in Hexham and Haydon Bridge this coming weekend. If you would like to come a long and join our campaign then email / call our office hexham@tory.org / 01434 603 777. You will get a warm welcome! What is the new role for the American President? I am delighted Barack Obama was relected. He is a great man, and a game changing politician. But questions remain for the role of the most powerful man on earth. His is by far the most difficult role I can think of for a modern politician. He faces a country that is increasingly polarised, an economy that is no longer the powerhouse of yesteryear, and a foreign policy decision of huge importance. As America and the UK thankfully gradually step back from Afghanistan the question still remains: is America the world's policeman? And to a lesser extent - are we in the UK? The context could not be more apposite. Osama Bin Laden is dead, yet Al Qaeda continues in force in Pakistan, and increasingly in Africa, as we have recently seen in Mali and Algeria. The Arab Spring is not just all about democracy and apple pie. It is also about a series of tribal struggles, and increasingly bitter civil wars, best exemplified by the turmoil in Syria. And all the while the nuclear threat of Iran looms. This is not a promising in tray for the new President. Some have said that whilst David Cameron speaks the right language, and has the best global intent, it is Obama who has the weapons, men and muscle; and yet how does he see his role? His speech primarily talked of the problems of injustice at home, not injustice abroad. Yet we need to face up to a disturbing reality. Proclaiming our values, our right to justice, a fair trial and a belief in democracy, and so much more, is not in an way in the short term going to stop terrorists bent on extinguishing us by any means necessary. Sadly what we are now engaged in on multiple fronts is an exercise in our human safety. How we best deal with that is the serious question. The issue of whether we are in such a fight is not, in my view, in doubt. To that end the American President is absolutely vital to this country, and all the western world countries. Snowdrift stops car. Farmers help MP! Got stuck in drifts twice last night. It was not a pretty sight. I was stuck on a slippery hill, with the snow drifting, and contemplating a long walk of 3 miles, and an abandoned car, to where I was stopping on the Military Road. I got out to survey the scene - which featured a tasty blizzard from the east, and a single house in the distance. After a while a 4 wheel landrover drove up. This being Northumberland the driver of the landrover stopped and immediately jumped out to help, even though it later transpired he was in a bit of a hurry. Then the farmer in the nearby house came out into the snow, surveyed the scene, and got out his tractor, and started to clear the road and try and put some salt on the hill. All of us by now were pretty wet, cold and these two wonderful men had dry warm houses to go to. Then my host turned up, and from the nearby house two girls from Shafto Young Farmers came out and surveyed the scene. With no towbar on the front of my car [not my fault I hasten to add] only one option remained: a very big shove. So 3 men and 2 girls pushed a car, driven by allegedly the lightest man, up a long big slope, all of us slipping on the icy road. There was a lot of grunting ... and a serious realisation that we may not be as fit as we thought we were. But after several minutes sustained pushing the top was made, my saviours were able to go back to their dry homes. The whole process took at least 30 minutes in constant snow and a stiff wind. For my part, pretty soon I was tucked up in a warm farmhouse at Moss Kennels, being served a large medicinal whisky. - not a day goes past when I do not thank my lucky stars that the good people of Hexham and West Northumberland chose me as their MP. There is a generosity of spirit in this place that is both uplifting and humbling. People help each other. - I was a bit mad to do a surgery call at 6 pm in an outlying area on a night featuring a drifting whiteout. The cynic would say I was getting the Good Lords comeuppance for venturing out on such a night in a normal vehicle without snowtyres, but I was keen to help. - I accept that this story will be repeated back to me in many a local pub, many times!, for a long time to come....and that I owe 5 very kind people a large drink. Lessons learnt: do not venture out unless you have the right vehicle. Its forecast for -4 overnight so watch out for ice in the morning. Will it be another year before we see Gordon Brown in the House of Commons again? I was gutted that I missed the chance to see a beast rarer than the Loch Ness Monster - Brown in the House. His 15 minute speech on Tuesday was on a legitimate local matter to be fair, but I still firmly believe you are elected by your voters to represent them primarily in Westminster. What kind of Europe do you want? As the PM gears up for his postponed big speech on Britains future relationship with Europe I am keen to ask the thousands of regular blog followers what kind of Europe they would like to see? Europe is changing and we need to decide in this country what role we wish to take in the new Europe. Most of those who want to keep the status quo are Liberal Democrat or possibly Labour. I do not want to leave Europe, but I do want a new relationship. The old phrase "In Europe, just not run by Europe" rings true. Certainly if the EU heads to ever greater union and ever greater soveriengty loss for Britain then I fear we would be left with little choice. i). Our American cousins are a little anxious: the Obama administration decided to give the British public an ill-judged, meddlesome lecture on the EU, warning David Cameron against holding a referendum on loosening this country’s ties with Europe. Philip Gordon, America’s assistant secretary for European affairs, was acting out of pure Washington self-interest when he said Britain needed ‘a strong voice in the EU’. ii). The Germans had a visiting delegation of MPs here recently and they declared that a UK referendum was a high-risk option that might paralyse Europe and end in economic disaster for Britain. iii). Meanwhile Mr Barrosso, the renowned opponent of referendums, chose the day after Eurozone unemployment hit a record high of 19million to state that "the worst is over". For my part I accept that we must monitor where the integrated Euro based EU is going before deciding our own direction. I am strongly in favour of the single market, but reform of regional spending, and the working time directive, are two early candidates for repatriation. Other key issues will be limiting residency rights to those with a job or other means of support. One thing is clear: we need terms of membership very different from Britain’s current situation. The Council has yet to confirm when it will reveal its plans for Tynedale and Ponteland's green belt. If the Lib Dem Administration wants to build on all, some, or none of the green belt then that is their democratic choice, but they must let the people have their say. What I am very concerned about is that the Council will delay unveiling its plans for the green belt until after the elections, denying people their democratic say. The Lib Dems who run the Council must be open and honest. If they hold back telling local people their plans until after the elections local people will know why; they are not stupid. In a few weeks time the Council will release it's latest document for its local plan. In it they should address their green belt plans. We have been waiting long enough, and local people want to know where they stand. Locally across my patch there is great, and legitimate, fear for the greenbelt, whether this is in Ponteland, or Hexham's West End. People must know these plans before they go to the polls in May. Big chunky flakes, proper drifts, + visibility 15 yards was my fun drive home to Stamfordham. Please be careful on the roads if you are going out tonight / tomorrow. For my part I have surgery calls in the morning - I may end up walking to Prudhoe - and then we have an Action Day, when we are knocking on doors in Hexham West, with around 10 people due to come out and help Colin Cessford. I have a feeling the pub may call quite early tomorrow afternoon, but we will still be there to help Colin, and will be super focused on the job in hand ... the only possible distraction could be a combination of a snowball and a Lib Dem! 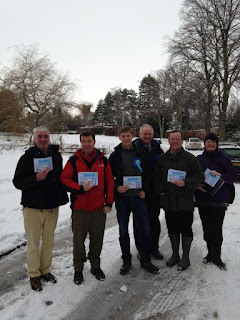 The Cities Minister Greg Clark MP is in town today, provided everyone makes it through the snow - including me! We have a variety of meetings this morning / lunchtime. I have a series of surgeries in Hexham later, including a meeting with the Police Federation, and then am speaking to the Hexham Business Forum at 6. If you are travelling on the roads take extreme care. Hundreds packed in to the Snods Edge village hall last night to question County Council officials and directors of UK Coal as to the proposed open cast mine next to Whittonstall School. The Courant were there and will report it. Dozens asked questions or made their views clear and the meeting ran for over 2 and half hours. Whilst the feelings were high, and the opposition to this plan is clear, the meeting was well conducted, albeit so many people came that they were literally queueing in the street to get in. - the committee need to take on board the cumulative impact of this and other energy projects that are already up and running. - the Energy Bill 2012 and other documents make it clear that coal use in this country must reduce not expand in the years to come. There remain for me significant possible environmental impacts and the transport proposal will see a massive increase in HGV traffic on the roads - both these issues need to be addressed going forward. As the day has unfolded I have received ever worsening reports of what has gone on in Algeria. It is likely that there is worse news on the way and my thoughts go out to the families of all the hostages at this time. Now is the time for the PM to be behind the desk in Number 10 coordinating our response, trying to track down the hostages and their families and doing all he and our specialist teams can do to assist a very fluid situation. Whittonstall Open Cast Mine Meeting is tonight! 6pm in Snods Edge will see the public meeting on UK Coal's proposed application for open cast coal mining. I have received a slip from the House of Commons to ensure I can be there. I would urge anyone interested in green belt development, open cast mining and the cumulative impact of energy policy on this area to attend. I have written at length on this application before on this blog, and spoken about it in the House of Commons, most recently on the 20/12/12 in respect of the lack of a County Council minerals plan. I have met repeatedly with the local community from 2009 onwards in local surgeries, in a long meeting in the local pub and in people's houses. Whilst I will go with an open mind to the meeting, and listen to what is said tomorrow night by all parties - and it is clear that there are some people in the community in favour of the application, and campaigning for the application - everything I have seen and heard, thus far, indicates that the vast majority of the population locally are against this application. For my part I am satisfied that there are potential legitimate objections based upon planning grounds, concerns as to the viability and intentions of the applicant, further concerns as to the impact on the green belt, and a real issue as to whether this is sustainable and appropriate development, given the two contrasting decisions by inspectors in relation to the Bradley decision [planning refused] and the Halton Lea Gate decision [planning granted]. I normally get back up North on a Friday but I have had a head start this week. Today I will out speaking to voters on the doorsteps of Hexham and Haydon Bridge with our candidates in this May's local elections. On Thursday I will be in Haltwhistle with local County Councillor Ian Hutchinson before heading down to for a public meeting on the opencast propsal at Whittonstall. Friday sees another busy day with meetings in Newcastle in the morning before heading into Hexham for a 4 hour Advice surgery, then I am giving a talk to Hexham Business Forum on the support available for business. Amongst many things in the Crime and Courts Bill that we passed yesterday is the welcome news that the innocent householder will have greater protection from the law when confronted with a burglar. The old law was reasonable force but this led to several householders facing possible prosecution in circumstances where the vast majority of the population thought this was wrong. We have also reformed community sentencing, created the National Crime Agency to target serious organised criminals, and amended Section 5 of the Public Order Act to remove the word insulting from it. This is a good bill which will make a difference on so many levels. I am heading back to Northumberland today. Sadly it's for a funeral of a good friend and a great man, Dr Alan Reece. Alan was one of the North East's most successful businessmen. Alan was the man behind the engineering business, The Reece Group, which has a turnover in excess of £211m and more than 450 employees. I was lucky enough in 2011 to go round his business, Pearson Engineering in Walker, which develops combat engineer systems and de-mining equipment for the US Army, along with my dad, who is a far better engineer than I ever will be. It was a fascinating day in a truly transformative company. Alan, was named by the Sunday Times in 2011 as the third biggest philanthropist in the UK; he gave generously to chairities and educational institutions. He supported the Wylam Post Office and the Calvert Trust amongst many local causes. He worked with me on a number of projects, especially on getting Britian to make more from the manufacturing sector. Alan leaves behind three children and his wonderful partner Margaret. He was an avid cyclist, a man of tremendous wit and sense of humour and a man totally without any side or pretence. He will be sorely missed, but I consider it a privilege to have known him. The Uk has provided 2 C17 transport planes to help the French efforts to restore order in Mali. France has sent around 550 troops to the central town of Mopti and the capital, Bamako. They are set to be joined by troops from the neighbouring African states of Niger, Burkina Faso, Nigeria and Togo, some of which are now expected to arrive in Mali within days. Mali is a landlocked West African former colony of France, with a population of 14.5 million, half of whom live below the poverty line. In March last year, a military coup toppled the democratically-elected leader, President Touré. The already weak central government lost control of the North of the country, which fell under the control of Ansar Dine, a radical Islamist group who have imposed Shari’ah law, and Tuareg rebels, who have long felt marginalised by the Malian government. This is linked to Libya. After Gaddafi fell, the Tuareg armed fighters he had been using returned to Mali. This led to a separatist war and formation of the unrecognized separatist Islamist state of “Azawad”, occupying a third of Mali’s territory. While there is not (yet) evidence that Islamists there will use this base to plan foreign attacks, the West is nervy – especially at signs that the insurgents aim to sezie the whole country. A number of atrocities so far have been reported so far, including the public stoning of a couple who were accused of having children outside marriage. Some 500,000 have reportedly fled the north since the Islamist takeover, 270,000 of them to neighboring countries. Ansar Dine has more recently begun to militarily move south, prompting UN concern and the French military intervention. Yesterday, Hollande announced a surprise French military action. Hollande has said his military will stay “last as long as necessary” to help Mali’s government recover. “At stake is the very existence of the Malian state,” he said. He has stressed that France is working under the remit of a UN resolution authorising actionThere are effectively three objectives: 1) reorganise the Malian army; 2) secure the transitional government in Bamako; and 3) retake the north from Ansar Dine. This has been previously done in Liberia and Sierra Leone. The idea would be African troops on the ground, with Western air support. I know there is little appetite for British boots on the ground, but this limited support with transport planes is perfectly legitimate, the right thing to do, and backed by UN Resolution. However, it is dismaying that there appears to be brewing another Islamist backed military uprising just as others are waning in the East. Another week and another step forward in our battle for a fair deal for Ponteland and Tynedale's schools. As many of you will know the Lib Dem County Council has in place pension arrangements which essentially prevent many local schools from being able to convert to academies. I'm sad to say it but Lib Dem Councillor Derek Kennedy, who heads the Council's Pension fund is simply out of touch with the concerns of Tynedale's schools. Cllr Kennedy and his Lib Dem colleagues are totally wrong to dismiss the concerns of local head teachers and governors on this issue. Some schools are very concerned that their options are being limited, because of the stance this Council is taking. I will not allow anyone, including the County Council, to hold back our local schools. Our children need the best possible education, and putting a 20% surcharge of our local schools becoming academies is limiting their prospects. If a school wants to become an academy the County Council has unilaterally decided to charge higher contributions to the Pension Scheme for an academy than if the school were a maintained school. There is no financial justification for this, as other authorities with similar age and debt profiles do not do this. Indeed, Northumberland is effectively unique in the country in its approach. The consequence is that any school who wants to become an academy is prevented from doing so because it would face a financial penalty in the process. Part of the background to this is the County Council's decision on Allendale Middle School. The County Council are looking to close it. If it does not survive other Middle Schools will be wondering about their fate, and the Councils approach to their continued existence. It is noteworthy that officers at the Council chose not even to offer academy as an option to the Allendale Middle School, when they unilaterally announced closure this autumn. Even though they are statutorily obliged to do this. Local people are drawing their own conclusions from that decision. Local schools are being told by the Lib Dem led County Council that they will need to make significant contributions for up to 25 years to build up their stake in the pension fund, as well as seeing their employer contributions rising from 12% to 26%. This could mean schools having to find over £300,000 per year just to uphold pension arrangements. Northumberland's LGPS Fund is due to be revalued in the next few years with the potential for the schools to be asked for even greater contributions. As well as an increasing following in Asia, the Gulf and some in Ireland, Sweden and increasingly in India. A big thank you to one and all and let me know if you want changes made. Our former PM will make his first appearance in months in the House of Commons next Tuesday. I swear I have seen him less than 5 times since May 2010, and this is his first speech in almost a year! He should resign and let an MP run who wants to contribute to the House of Commons - which is where we are supposed to be most of the time. Yesterday the Backbench Business Committee debated the issue of dementia care: it was a wonderful occasion featuring outstanding speeches, great emotion - as several MPs broke down when reliving their personal experiences, and a collective will to address this terrible disease. There is no difference between heart disease, cancer and dementia. They are all killers. The link above is to my speech but if you are interested in the House of Commons then read the contributions of the Labour members Debbie Abrahams and Margaret Moon. They, amongst many, spoke beautifully. I spoke as to Northumberlands dementia situation and the difficulties of rural healthcare, but the best news is the increased funding for dementia care and the greater focus that the DOH is now bringing to bear on this disease. I try and write regularly on transport matters because they are genuinely very important. Whether it is Torchgate, road improvements, or rail franchising the fact is that transport really matters locally. And this is without taking into account the constant need to address the problems locally with gritting on winter roads, cleaning of gulleys, and so many more things that people write in to me in the House of Commons on transport issues. Virtually not a week goes by without us receiving a steady stream of transport issues concerning local problems. We have long been trying to persuade Network Rail and Northern Rail to look at reopening Gilsland Station. It was the second key issue raised when we met with the Northern Rail team last autumn at the Valley, and it would clearly transform the tourist, travel, business and other prospects of the very western area of the County. Rory Stewart, my neighbouring MP also supports the plan. I am a big supporter of the Tyne Valley Rail Users Group and welcome their lead, and will be contributing to the feasibility study. There is a case to be made not least because there have been persistent problems with buses in the area, and the tourism busineses which I know well would be very pleased. Anyone who walks the Hadrians Wall or Pennine Way would in particular be delighted. I urge people to make their views known locally. The simple truth about this Government’s changes to taxation is that the rich are paying more now than they ever did under 13 years of Labour. Ed Miliband and his cronies had no answer to that fact in the welfare debate on Tuesday, and had no answer at PMQ’s yesterday. Even their friends in the press admit it. Tim Montgomerie: "Are the rich paying more in tax than under Labour?" Kevin Maguire: "Yes! Weakness for Mili unless he accepts Labour 13 Year cowardice and pledges to restore 50p on fairness grounds." It is also worth bearing in mind that for 13 years of the Labour government the top rate of tax was 40 pence. They raised it in the last 35 days of their term in April 2010. It is almost laughable when they criticise this government for only having a 45 pence top tax rate. My Liberal colleagues in the House [Sir Bob Russell, and Simon Hughes in particular] constantly chant to the labour benches "13 years - 40 p". As they make clear - Sir Bob is very robust - it is not an ineffective chant. I believe that we need to concentrate on now is ensuring that we commit to our pledge to increase the tax threshold to £10,000. I am proud that this Government has taken two million of the lowest paid out of paying tax at all, and that those on the minimum wage have seen their income tax cut in half. Slowly but surely we are once again making work pay in this country. Scotland Questions 11.45 today - will we need border controls? I am live in parliament shortly before PMQs in Scotland Questions, at around 11.45, asking whether independence would lead to Border Controls at Carter Bar and all along the border. I have 2 questions and will be interested how the Scot Nationalists fancy a new Hadrians Wall at the border? I do not want it and I can find few locals who want to lose the union, but we need to make the reality of the case of Scottish Independence plain to one and all - not least the Scots themselves - as Salmond still refuses to say what the reality of independence will be for both countries. January 1852 saw the first journey between Paddington and Faringdon on the Metropolitan Railway. At the time newspapers were against the idea - not least because the Metropolitan Railway was steam operated, but 30,000 people tried it day one and it remains the oldest tube in the world. Indeed the tube worldwide is called the "Metro" after that first Metroploitan Line. Within years the village of Hammersmith, full as it was of vegetable gardens, was becoming a suburban commuter home because it was connected to the tube. Bear in mind that for the next 50 years the Victorians endured constant digging, blockages and delays as the tubes were built all across London, coinciding with everyhting from the famous sewer rebuild and the creation of so many infrastructure projects. Northerners sometimes complain that the transport spend is too much upon London but take out Crossrail and there is almost no internal London transport infrastructure project. I took the tube to work this morning [rain meant no biking] but we should be grateful that our forebears had the strength to push through such huge projects. Tonight we vote on whether to cap welfare benefits to 1%. Labour are opposed to the cap, I support it and will be voting with the Government. Let me firstly say that I do not believe most people on benefits in the North East, or anywhere else, are "scroungers", or any of the other horrible language that has been thrown around in this debate. This debate for me is purely about fairness. Because of the dreadful economic mess we are having to clear up lots of people are facing a tough time. Higher earns are losing their child benefit payments all together. Those in the public sector have had their pay rises capped at 1%. Quite rightly pensions and disability benefits are not included in the 1% cap. All the Government is proposing is that benefits (which have rose than faster than earnings in the past) are limited to the same rise as that being given to nurses, teachers and policemen. Is that really so outrageous? The most shocking thing is that Labour support the 1% cap on public sector wages but oppose it benefits. How can that be logical, let alone fair? Balls and Milliband are totally out of touch. The truth is that Labour are not serious about welfare reform. They pay lip service to it to try and please the pollsters but oppose every single measure we have made to make the system fair. Most importantly they oppose our overall cap on benefits of £26,000 per household. They believe it is right and fair that a family on benefits can get more in welfare payments than the same family next door does my working. I don't. It's not about putting those on benefits against those who work - it is about designing a system which mean work always pays, which means it is always better to be working than on benefits. Labour, as it was when they where in power, don't think that matters. Well I do. The 1% cap will also save vital tax payers money as we try to bring down the defiect, around £5billion. Where would Labour find that extra £5billion? Closing hospitals? Slashing pensions? Labour need to fire 140,000 teachers to make up the short fall. Ed Milliband would do well to listen to Jacqui. 51. Less red tape for business. For example, increasing the qualifying period for unfair dismissal claims from one year to two years from next April means anyone taking on a new employee can now be confident that they have two years to get the relationship right, rather than just one, before they face being sued for unfair dismissal. For businesses with fewer than ten employees, a moratorium on new domestic regulation for three years has been introduced. 52. Less red tape for everyone. From this month the "one in, one out" rule is changed to "one in, two out." This excludes regulation imposed by the EU. So far 3,000 of the regulations examined will be scrapped or reduced after nominations from the Red Tape Challenge. Lots of regulations are individually trivial, but cumulatively burdensome. People wanting to get married or register a civil partnership will be able to do so at any time of the day or night under the Protection of Freedoms Act. Couples were previously restricted to between 8am and 6pm. Gambling rules had meant, for example, that it was against the law to employ anyone under 18 in any capacity or in any job on racecourse where betting takes place. Also you couldn't locate a fruit machine in an ‘airside bar’ at a British airport. 53. Reducing rent subsidies for the rich. There are 34,000 households with incomes of over £60,000 living in council houses. 54. In 2010, 312,911 individuals in need of social care chose to have personal budgets. In 2011 it had increased 53% to 429,349. A legal right to a personal budget is being introduced. 55. Tax Transparency. From next year each tax return will show each taxpayer what their money is spent on. For example someone earning £25,000 spends the equivalent of £1,900 of their tax bill on welfare payments. 56. There are 10% fewer crimes each year than under Labour. 57. In December 2011 David Cameron vetoed an EU Treaty which would have meant a further loss of sovereignty. 58. Northern Rock has been privatised. The bank was sold to Virgin Money for £747 million. Under its new branding, new branches are opening, providing more choice. This is a first step to getting the state out of the banking business. 59. 24 Enterprise Zones have been created. These areas offer new businesses lower tax - with no business rates for five years and higher capital allowances as well as less planning bureaucracy. 60. The number of divorces in England and Wales in 2011 was 117,558, a decrease of 1.7% since 2010, when there were 119,589 divorces. 61. Funding for new fixed speed cameras has ceased. 62. The £4 million Big Tree Plant has seen over 239,000 trees planted across the country with £3.4 million of the funding already allocated to 128 groups, who will ultimately be planting more than 813,000 trees. 63. Forcing someone to marry will become a criminal offence in England and Wales. 64. The law of self defence against burglars is being strengthened. 65. The Life in the United Kingdom citizenship test is being revised with sections dealing with claiming benefits and the Human Rights Act being scrapped. Instead there will be questions on Byron, the Duke of Wellington and Shakespeare. 66. 7,000 acres of surplus state-owned land is being sold to provide a 100,000 new homes. It is estimated the sale will raise £10 billion for taxpayers. Leading by example, the Government has reduced the carbon footprint from its own buildings by 14% on the level under Labour. For example, HM Revenues and Customs (HMRC) encourages customers to complete tax returns online. Using text messages for alerts has contributed to a fall in paper use by 30 million sheets in 2011/12, saving £297,000 as well as cutting carbon associated with printing and distribution by 760 tons. The Department for Energy and Climate Change has installed a dedicated 16kW chiller for its server room which had previously been cooled by two 60kW chillers, this is on track to save 80 to 90 tons of carbon per year compared to when Ed Miliband was running the Department. 68. Crime mapping has been introduced. 69. Fewer spin doctors. In the Department for Work and Pensions the press office has fallen from 301 staff in 2009-10 to 215 now. When Ed Miliband was Energy and Climate Change Secretary there were 43 DECC spin doctors - now it's 25. 70. Boosting the number of staff-led mutuals running public services to increase innovation, productivity, and customer satisfaction. The number of mutuals is six times higher than under Labour. 71. Social Impact Bonds allow private investment for a beneficial social outcome on a payments by results basis. A scheme in Peterborough Prison to reduce the reoffending rate shows very encouraging initial results. The Coalition is committed to expand these Bonds. 72. Open Government. The data.gov.uk website provides key information on transport, health, education, transport, crime and justice as well as Government spending. 73. Efficiency savings through renegotiating contracts, cutting back on spend on consultants and advertising is saving £8 billion. 74. Squatting has been criminalised. We’re selling tea to China, vodka to Poland and cheese to France. There’s a baker in Dunstable selling naan bread to India, and we are selling coffee-makers to Italy. A firm in Anglesey is selling canoes to the eskimos. The UK now exports more cars than we import for the first time since 1976. We have increased our exports to Brazil by 18%, to China by 21%, and to India by 34%. We now export more to outside the EU than inside the EU. Free trade with developing countries is being promoted which helps make poverty history as well as boosting exports. The UK Government has backed free trade via the EU and the WTO and started the African Free Trade initiative. 76. Public sector sickness absence was an average of 9.1 days per employee in 2011, a decrease of 0.5 day from 2010. 77. Greater rigour in school exams. Primary school pupils are no longer able to go into their maths exam with a calculator. GCSEs are ceasing to be based largely on course-work and modules - instead there is a shift to final exams. 78. The Troops to Teachers programme, which aims to increase the number of service leavers making the transition to teaching. 79. The planning system has been simplified. Planning rules have been reduced from over 1,000 pages of often impenetrable jargon into around 50 pages of clearly written guidance. 80. 100 new cadet units are being created based in English state funded schools by 2015 to help teach teamwork, discipline and essential life skills.Currently there are 324 cadet units in state schools across England. 81. The introduction of the Universal Credit will make sure that work really pays, replacing many out-of-work payments with a single, simple payment.It will be withdrawn at a constant rate, so that people know exactly how much better off they will be for every extra hour they work, to ensure that work always pays more than benefits. The poorest will be the biggest gainers. 82. Fairer disability benefits. Under Labour those claiming Disability Living Allowance increased from 2.5 million to 3.2 million. It was possible to get £130-a-week DLA simply by filling out a bit of paper while those with serious disabilities had to cope with complicated 38-page forms to fill in. 83. A £26,000 benefit cap is introduced. They’ll still, however, have more money than many of their neighbours who go out to work every day. 84. A right to bid has been created, giving community organisations a fairer chance to save assets of importance to them, such as their village shop or the last remaining pub in the village, their community centre, children’s centre, or community green spaces. 85. “One-click registration.” From April if you want to start a business there’ll be no more filling in endless forms, giving out the same information over and over again. You’ll be able to get online, set up your business and register for taxes – and see the taxes that you’ve paid and that you owe – all in one place. 86. A requirement for dole claimants to learn English. New rules means Jobcentre Plus advisers can mandate people with poor English skills, which are preventing them from getting into employment, to go on to free specialist English language training courses. If claimants refuse to attend any of the classes recommended to them, they could have their benefits stopped. 87. Expansion of the Teach First programme which takes top graduates and puts them straight in the classroom. 88. Superfast broadband availability increased faster than previously scheduled by easing bureaucratic delay in planning and traffic management. 89. The London 2012 Olympic and Paralympic Games were delivered under the budget projected in 2010. The funding was £476 million below the £9.298 billion budget. Under Labour costs grew out of control from the original £3 billion budget. (It's worth saying that the Games also went pretty well!!!). 90. A growth in credit unions. The Government are allowing credit unions to expand so that they can help one million more people. Credit unions are social enterprises that offer an alternative to loan sharks. The viability of credit unions is being assisted by an increase in the 2% monthly cap on interest rates. 91. Everyone leaving prison and claiming Jobseeker’s Allowance benefits will be immediately referred on Day One to the Government’s Work Programme, where they will receive specialist support to get them into employment as quickly as possible. 92. The Fuel Duty rise, scheduled by the Labour Government, of 3.02 pence per litre on 1 August 2012, was scrapped. 93. The M4 bus lane has been scrapped and the lane returned to all motorists after analysis showed that journey times at peak periods would be reduced for car drivers and hauliers without significantly affecting vehicles currently allowed to use the lane. 94. Spending transparency. For Government departments all payments over £25,000 are published. For local councils all payments over £500. Increasingly lower thresholds are being applied and spending transparency is being extended across the public sector. 95. More electrification of the railways. In 13 years the Labour Government electrified just 10 miles of railway, the new Government is doing so for 850 miles. This will deliver new fleets of cleaner and more environmentally friendly trains and reduce the long-term costs of running the railways. 96. The Youth Contract has boosted apprenticeships to half a million a year, double the number under Labour. There were 279,700 apprenticeship starts in the 2009/10 academic year. In the 2011/12 academic year there were 502,540 apprenticeship starts. 97. Taxpayer funded trade union facility time will be restricted. Full time trade union officials will need special Ministerial approval. 98. 2.5 million people once on sickness benefit are being re-assessed and two thirds preparing or looking for work. 99. There are 124,000 fewer lone parents on inactive benefits than there were in 2010. 100. Traveller sites. Stop Notices will allow councils to issue unlimited fines for those who ignore planning rules and defy the law. 1. 2,543 schools are now academies. In May 2010, there were just 203 academies, all of them failing schools required to become "sponsored" academies, and all of them secondary schools. 2. 200 of the country's worst primary schools had been turned into sponsored academies by the end of 2012. By the end of this year 400 of them will have been. In 2011, sponsored academy results improved by 27.7% - compared with 14.2% for state schools in general. 3. 79 free schools are open and a further 102 have been approved to open - mostly in September 2013. 4. There are 220 fewer Quangos than there were in May 2010. Quango spending has been cut by £17 billion. The savings on Quangos abolished altogether is £2.6 billion. Within the Department of Communities and Local Government, the Tenants Service Authority, Standards Board, Infrastructure Planning Commission, Regional Assemblies have been scrapped, while the abolition of the Audit Commission is saving £650 million of taxpayers’ money over five years. The abolition of Government Offices for the Regions is saving £420 million of taxpayers' money (from 2011 to 2015). Other Quangos have had their budgets cut. Under Labour Quango's cost £46 billion annually - the comparable figure (excluding the £2 billion for the Legal Aid Fund in both cases) is now £29.2 billion. 5. The "right to buy" your council flat has been reinvigorated. The discount for council tenants has been boosted to as much as £75,000. 6. The Territorial Army is doubling in size from 15,000 to 30,000. 7. From April, people can earn £9,440 before paying income tax. Under Labour, this personal tax allowance stood at just £6,475. As a result, 24 million taxpayers have seen their income tax cut. Two million of the lowest paid have been taken out of paying tax altogether. Those earning the minimum wage have seen their income tax halved. 8. From April 2013, the 50% top rate of tax will be cut to 45%. HMRC data reveals that in the first year of the 50% tax rate, tax revenues from the rich fell by £7 billion and the number of people declaring incomes over one million pounds fell by a half. 9. Corporation tax has been cut from 28% to 24% and is falling to 21% next year. This is the lowest rate of any major western economy. 10. Those who can work, but refuse to, are ceasing to receive welfare benefits. When invited to take part in a Work Programme there were 150,000 who stopped claiming benefits rather than participate. Of those who have taken part, 200,000 have been placed in jobs. Those who don’t find jobs via the Work Programme will go through a Community Work Programme where they work 30 hours a week for 26 weeks to contribute to their community. For claimants refusing to participate, benefits will be withdrawn for three months for the first offence, six months for the second, and three years for the third. 11. Over 400,000 more people are in work than in 2010. Over one million net new private sector jobs have been created. The unemployment rate is 7.8% down 0.5% on a year ago. This is during a time of rising unemployment in the Eurozone. 12. More children in care are being given the chance of adoption. The number of children in care rose under Labour from 51,490 in 1997 to 64,410 in 2010. The government are reversing the trend by allowing more children to come out of the care system and be adopted, having the opportunity of permanent loving homes. 3,450 children were adopted in 2011-12, an increase of 12% on the previous year. The scandal of children being kept in care in preference to transracial adoption is being outlawed. 13. Elected police and crime commissioners have brought in a new era of accountable policing. 14. Legal aid has been restricted. This is saving the taxpayer £350 million but also reducing unjustified, time wasting litigation, in matters such as health and safety, and welfare and immigration cases. 15. Home Information Packs, a bureaucratic impediment on the housing market, have been dropped. 16. Labour's £4.5 billion ID Cards has been abandoned. This is a clear message that the state should be the servant, not the master of the people. 17. An EU referendum lock gives some protection against further loss of sovereignty. 18. The earnings link has been restored for pensioners. 19. The operational allowance for the armed forces has doubled. 20. A New Enterprise Allowance scheme has helped 8,000 unemployed people set up their own businesses. Those with a viable business plan are helped with loans and mentors. It is being extended further to allow 70,000 dole claimants the chance to become entrepreneurs. 21. The National Citizen Service has been set up in partnership with groups like the Prince's Trust. Teenagers go on outward bound courses, talk to mentors about 'social action projects' in their communities, and then are helped to get on and accomplish those projects. Those taking part have the satisfaction of doing something enjoyable and positive - while participation will be an encouraging line for prospective employers to see on a CV. By next year 100,000 places will be available. The International Citizen Service, which is funded by the Department for International Development, is another new global volunteer programme for young people. 22. The armed forces are being treated decently. The Service Pupil Premium has increased from £250 to £300 per pupil and will be extended to include all pupils whose parents have died in service since 2005. The principles of the Armed Forces Covenant have become law. The Government has quadrupled the council tax discount for forces on operations. The forces are getting the equipment they need for the job: the helicopters, protective kit, and armoured vehicles they have lacked in the past. 23. Immigration has been capped. The Government is making progress in cutting net immigration from the hundreds to the tens of thousands. 24. Freeing Libya. The UK played a key role in the overthrow of the Gaddafi dictatorship. Our military intervention averted a massacre in Benghazi and toppled an international criminal who gave Semtex to the IRA and was responsible for the shooting of a police officer in a London and the bombing of a plane over Lockerbie. 25.The Troubled Families Initiative. Work has started for 120,000 troubled families in England to turn their lives around by 2015. It involves dealing with each family’s problems as a whole and appointing a single key worker to help. Previously, endless over- and underlapping agencies have been involved ineffectively. Councils will be paid by results, as measured by getting children back into school, reducing youth crime and anti-social behaviour, putting adults on a path back to work, and reducing the high costs these families place on the public sector each year. 26. More Big Society volunteering. The number of volunteers helping in their local libraries is up from 17,550 in 2009/10 to 23,397 in 2011/12. In 2010 there were 15,505 Special Constables. In 2011 there were 18,421. As of March 31st 2012 there were 20,343. 27. The Government is encouraging investment in shale gas - which offers tremendous opportunity for a reduction in energy prices. 29.The power of the state to inspect your dustbin has been abolished. 30. The Royal Mail is being privatised in a way that will increase employee share ownership. 31. The civil service is smaller than at any time since the Second World War. For example, there are plans for the Ministry of Defence to shrink by more than a third - losing 30,000 civil servants. 32. Councils that fail to provide weekly bin collections will face financial penalties. Already the decline in weekly bin collections has been halted. There is now the prospect of it being reversed. 33. In May 2010, over 18,000 people had waited over a year for NHS treatment. Now it is 4,317 people. The number waiting six months is down from 100,979 to 55,335. 34. MRSA infections are down 24.7% in NHS hospitals compared to the level under Labour. 35. Independent economic forecasting has been provided by the Office of Budgetary Responsibility. 36. The Drug and Alcohol Recovery "payment by results" pilot ceases rewarding providers for "inputs" (the numbers entering drug treatment, regardless of what then happens to them). Instead the payment is for outcomes achieved - full recovery, including completing treatment and not returning; reductions in re-offending and improved housing, health and wellbeing. 37.Police pay is rewarding performance. Constables will be able to move to the top of their pay scale quickly, sergeants will get a greater reward for stepping up from constable, and inspectors will be able to reach their rank more quickly. 38. The teaching of history in schools is being revived. 39. Council housing allocations can reward merit - those who work, serve in the armed forces, or make a community contribution can be prioritised. 40. Employee share ownership is being promoted with a voluntary scheme allowing new recruits to wave entitlements such as unfair dismissal / redundancy rights in return for shares. 41. The share of our money taken from us and spent by the state is falling.In the last year of the Labour Government, 2009-10, public expenditure as a percent of GDP was 47.8%. In 2011/12 it was 45.2%. The Office of Budgetary Responsibility projects that it will fall to 39.5% by 2017-18. 42. The New Homes Bonus has provided a local incentive for building property. It has also meant a reduction in the number of empty homes with 38,000 long-term empty properties brought back into use over the past two years. 43. The deficit has fallen by a quarter. The last year of Labour Government, 2009/10, showed borrowing at £159 billion. In 2011/12 £122 billion was borrowed. 44. Trade union membership in 2011 is down 143,000 on the previous year. From 26.6% of employees to 26%. 45. The UK has gone from 89th to 72nd in competitiveness for "burden of government regulation". Under Labour, the UK fell from 4th to 89th in terms of competitiveness for "burden of government regulation." (World Economic Forum, Global Competitiveness.)46. Emigration from the UK is down. 47. The income of charities rose from £54 billion in 2010 to £56 billion in 2011. The tax burden for charities is being cut. The Small Donations Bill provides a new system of top-up payments similar to Gift Aid for small cash donations to charities. For donations of less than £20, charities will be able to claim back 25p for every £1 collected in the UK, up to a limit of £5,000. 48. There is less red tape for police officers. The time saved on form filling amounts to 4.5 million police hours a year, the equivalent of 2,100 police officers on the streets. An array of box ticking police targets have been scrapped. Police led prosecutions have been extended to cover over half of all cases heard in a magistrate's court - this means less bureaucracy and delay than using the Crown Prosecution Service for straightforward cases. 49. Less red tape for teachers and headteachers. The School Admissions Code has been cut from 138 pages to 61. Health and Safety guidance to schools has been cut from 150 pages to eight, making school trips easier. In total 5,000 pages of guidance to schools have been removed. Teachers have more power to exclude disruptive pupils. Heads have more power to remove incompetent teachers. 50. Less red tape for farmers. For example, the Agricultural Wages Board which duplicated minimum wage rules has been scrapped. Hat Tip to the excellent Harry Phibbs over at ConHome for putting together the list. I will reblog the last 50 tomorrow. Want £2,500 to start your own business? I am pleased to note additional support for the next generation of entrepreneurs which the government has announced. The Start-up Loans scheme is to receive a £30million boost taking the total pot to over £110million over the next three years. In addition, the upper age limit for those who can apply for loans has been raised from 24 to 30 years. In the three months the scheme has been live, over £1.5million worth of loans have been approved, benefiting over 460 start-up businesses. Throughout January, around 100 new businesses are expected to reach approval stage each week with many more benefiting in the coming months. This is a great scheme to help the next generation of entrepreneurs get the financial help – and the confidence – to turn that spark of an idea into a business. I am a big advocate of reforming our banks to they give small businesses the lending support they need, in the mean time this is a great scheme to help entrepreneurs. Start-up Loans are just one of many ways this Government is taking action to ensure SMEs get the finance they need to grow. The Enterprise Finance Guarantee has helped 2,100 small firms to obtain bank finance, the Seed Enterprise Investment Scheme encourages investment in small and early-stage companies and, since May 2010, Enterprise Capital Funds have invested more than £90million in over 70 companies. How Labour can justify supporting our tough but necessary cap on public sector wages at 1% - yet believe those out of work should receive a higher increase is beyond me. I have been back at work in Westminster since January 2nd catching up on the letters, emails and requests of constituents and preparing for the start of the new term on Monday. Monday also features Home Office Questions and various Urgent Questions to Ministers on topical issues. Once again I urge as many constituents as possible to come and visit Parliament - it is your Parliament afterall. Tours are easy to arrange and well worth it - simply call the London office on 0207 219 7227, and Pete from Stocksfield will pick up the phone and sort things out for you. All of us who work here consider it a great privilege to be in the mother of parliaments, in an amazing set of buildings, where history stalks you with every step. We are all custodians of something far bigger than any government, or MP. Both governments and MPs come and go but democracy, the rule of law, and the representation of the people, by the people, goes on. That is something very special that we should all be proud of. Last year's most depressing meetings for me were the times when I had to meet and advise local people who had suffered from the Arch Cru mis selling scandal. I have many constituents who are affected by this, although fortunately not as many as were affected by Equitable Life. The scandal arises because normal people took their savings and invested in what they thought were "low risk" investments, when they were clearly anything but low risk. The funds have got into terrible difficulties and an administrator is trying to get back as much as is possible for the investors. I am the secretary of the All Party Parliamentary Group on Arch Cru, and have joined forces with Labour and other members of parliament to try and seek redress for the victims. The limited good news is that there will be some recovery, but the reality is that such a recovery is going to be a fraction of the original safe investment, and the recovery is taking a long time. I met with some of the local victims in the autumn in Hexham. All felt understandably very hard done by, powerless, and some were clearly struggling to survive. In the House of Commons we are doing what we can to keep the pressure up on the FSA, the administrator, and the various other organisations involved to see that our constituents recover as much as is possible. People talk about the glamour of life as an MP but most of it is helping people through life's unfairnesses: the sad reality is that people only tend to come to see me for my help when all else has failed them. Arch Cru and its effects is just such a case. 2013 will be a good year if we can get some redress for the victims both locally in Northumberland and nationally. One of the topics I speak on most in the house is energy. From Britain's energy security to fuel poverty I believe it is a topic which will dominate over the next decade. Is there too much, or too little, focus on renewables? Is coal a thing of the past or a legitimate future option? Can carbon capture change the energy equation? Are we right to rely on gas in the short term? What is the future of newer renewables like tidal power? How much can and should we rely upon Nuclear power? Should the state continue to subsidise commercial biomass on domestic timber? What chance is there that the lights will go out by 2018? Having looked at the evidence I myself am a big supporter of shale gas and have spoken repeatedly in support of it in the House of Commons. It has not just brought down domestic energy prices but it has genuinely changed the industrial prospects of the USA; this new cheaper energy is one of the biggest reason why the US has been able to remain competitive. I believe the latest Energy Bill contains a good blend of short term resolution of our energy needs, with a correct desire to continue decarbonise over time. I am a committed environmentalist but this Energy Bill of Ed Davey's does, I believe, create a healthy balance. The Chancellor has also recently made it easier for business to put shale gas into that mix which I believe will help even further. International politics: As Syria descends into civil war, the focus will shift to Iran and its nuclear intentions. World leaders will have to make very tough decisions on the middle east generally and Iran in particular. My one strong prediction is that Assad will not be the leader of Syria by the end of 2013. The end game for him is nigh. Big Local Issue 2013: I predict the issues around our green belt will dominate locally in 2013.
International Democratic Day of the Year: the Falklands Referendum on March 10th 2013 - when the local people finally are able to make their feelings clear. I happily predict the islanders will vote to remain British. Local Democratic Day of the Year: May 2nd when Northumberland goes to the polls. I will put my neck on the block and make two predictions; 1) The Conservatives will have more seats that we have now 2) The Conservatives will win one or both of Hexham West and Haydon and Hadrian. In the Arts: The Oscars are the only show in town in the spring so my strong prediction is Best Actor to Daniel Day Lewis in Lincoln, with Les Miserables as Best Picture. And finally...Sport: Not my finest predictions last year, but here it goes for 2013. Murray will win Wimbledon, England will win back to back Ashes series, Man United will win the League, and Rory McIlroy will win the Masters, only to be denied a grand slam by Ian Poulter who wins the Open. Come back in 12 months time to see how I got on!